of the Beggars Bush Barracks. 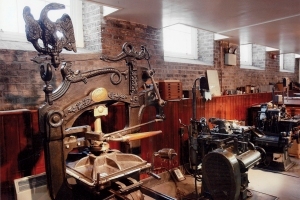 Their charming space is crammed with presses, type cases, and printing machinery of all types, along with a space where you can practice setting typing yourself. 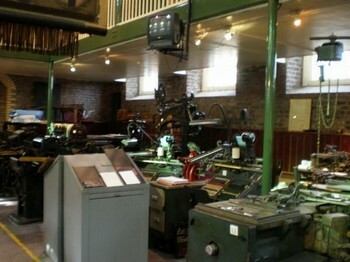 They have a Linotype machine, an enormous Albion iron press complete with a life-size eagle on top, and an historic wooden press, among many others. 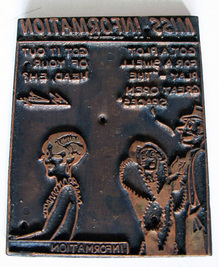 The flong for the front page of the last Irish Times to be set with hot metal is on view. 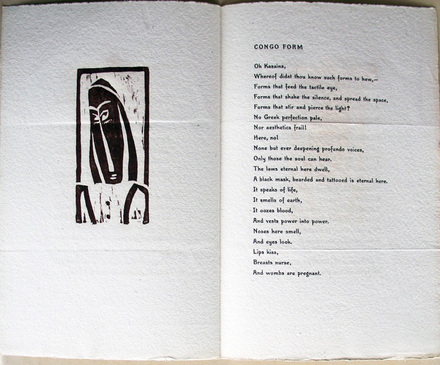 Upstairs is an exhibition of letterpress artists' books, which includes one example with poetry by our own Professor Paul Muldoon. William Sommer. "The apples, Bill, the apples!" 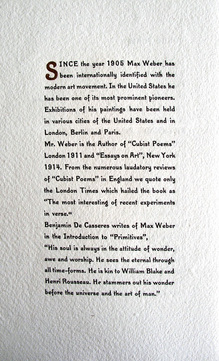 The Graphic Arts Collection is fortunate to hold seventeen works by the American painter and muralist William Sommer (1867-1949). Born in Detroit, Sommer worked as a commercial lithographer in Boston and New York City before traveling to Munich to study painting. 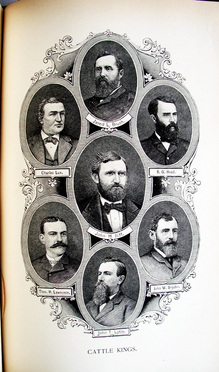 He and his wife returned to the Midwest and settled outside Cleveland. 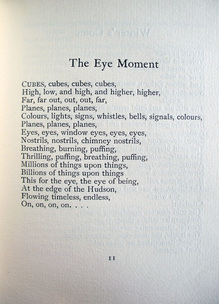 The Ohio poet Hart Crane (1899-1932) left home for New York City at seventeen but returned periodically to visit family and friends. 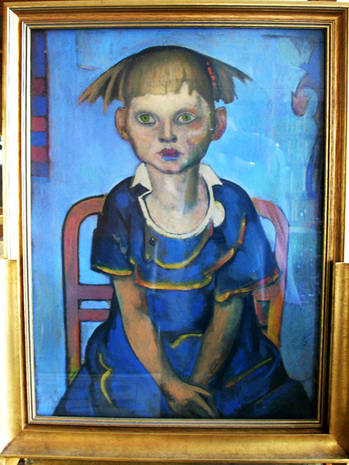 He frequented Richard Laukhoff’s bookstore in Cleveland, as did the painter Bill Sommer. When they met, Crane was twenty-two and Sommer was fifty-four but they found in each other a kindred spirit. 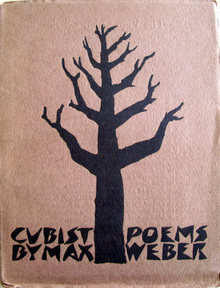 He sent a group of Sommer’s paintings and drawings to New York City, where William Carlos Williams purchased one and two others were published in The Dial. 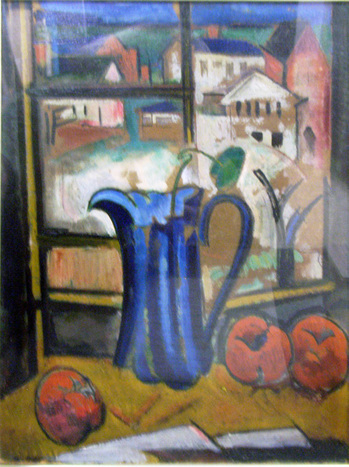 Later, Crane wrote a poem dedicated to Sommer entitled “Sunday Morning Apples” (1927), referring I believe, to the painting above. That are your rich and faithful strength of line. From whiteness that cries defiance to the snow. That feed your inquiries with aerial wine. The apples, Bill, the apples! 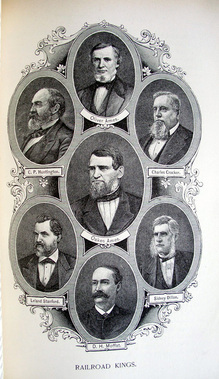 In a recent Times Literary Supplement (June 8, 2012), a review of three new books, each focused on the development of the American railroad, is illustrated with an image simply captioned “Railroad Kings: a nineteenth-century illustration.” Since there were more than a few illustrations in the nineteenth century, I thought a little more information might be helpful. 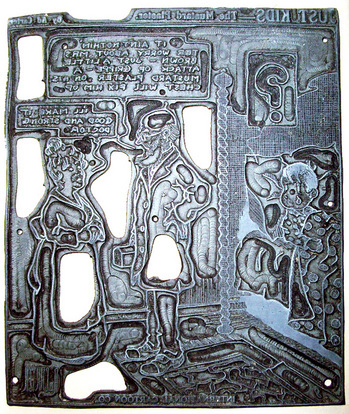 Thanks to the generous donation of Charles Rose, Class of 1950, P77, P80, Graphic Arts now holds 1429 zinc and aluminum printing plates for comic strips syndicated to American newspapers from the 1920s to the 1950s. 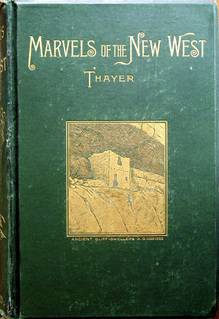 The plates originated with Abraham Meyers, whose American Melody Company or Meyers List (newspapers knew the firm as International Cartoons or Empire Features) was founded in 1898. 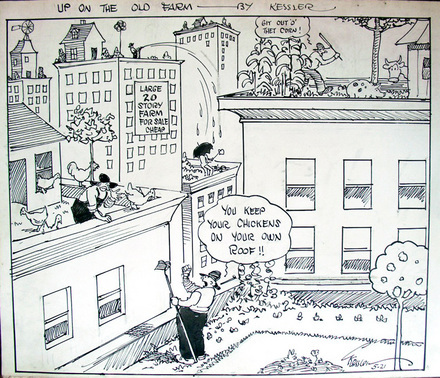 At first a distributor of sheet music, Meyers transitioned to comic strips in the early 20th century. 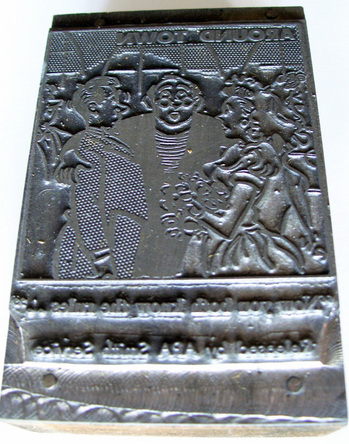 One package of zinc printing plates was shipped to each newspaper at the beginning of the month and then returned. There was no sequence or simultaneous publishing of comics in city papers around the country. In 1934, the firm passed to J.R. Kramer and then, to Kramer’s son-in-law Charles Rose, who bought out the company in 1967. He and his wife ran the business until the Meyers List was dissolved on March 20, 1977. 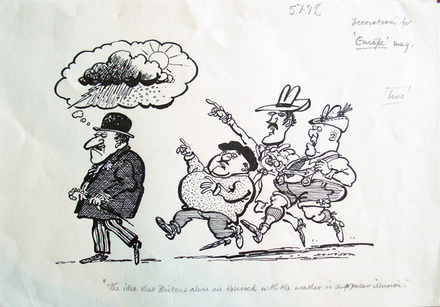 In addition to the plates, record books for the business, various teaching materials, and several albums of published strips, Princeton received 86 original pen and ink drawings for cartoons by Camillus Kessler, an active but little documented cartoonist. 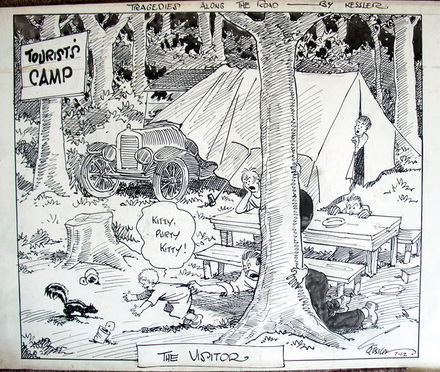 Kessler published comics in the New York Globe and Advertiser, New York Evening Graphic, New York World, and other papers from around 1914 into the 1940s. 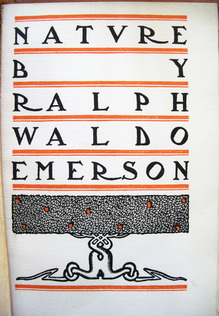 Firestone Library holds two compilations of Kessler’s work: At the Bottom of the Ladder (Philadelphia: J.B. Lippincott Co., 1926). 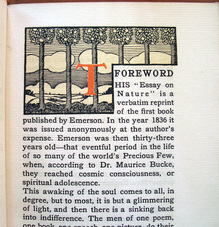 NC1320 .K44 and Twenty-Five Years Ago (New York: Coward-McCann, 1931). NC1320 .K45. 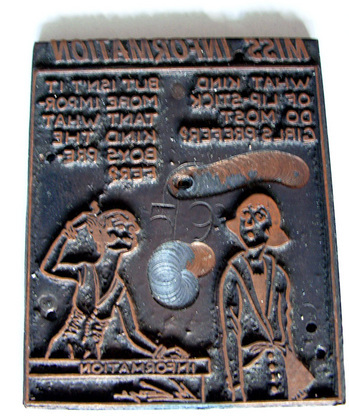 Most recognizable of the printing plates are the 652 zinc two and four panel plates of Just Kids drawn by New York cartoonist August Daniel “Ad” Carter (1895-1957). The strip began in the summer of 1923 and ended with Carter’s death in 1957. 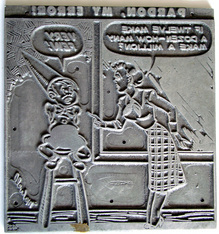 Also included are 52 zinc printing plates for Betty’s Beanery by Samuel Maxwell “Jerry” Iger (1903-1990), who had a partnership with Will Eisner (1917-2005); 32 single cell zinc printing plates for The Debunder by John Henry Fudray; and 15 single cell electrotype plates for Miss Information drawn by Barnet Cohen. 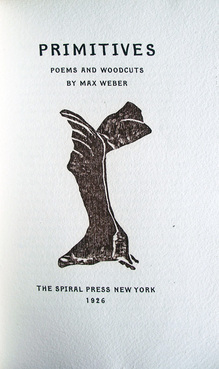 There are 52 two cell zinc plates for Hospital Quips by Rube Weiss, who is also known for Have Fun!, Josh Billings Sez, and Live ‘n Laff; 8 plates for Things That Never by Gary Bryne; and 7 for That Little Gamer by Link. 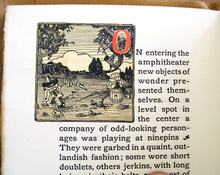 201 five panel zinc plates are for the comic strip Huckleberry Finn by Dwig and 200 aluminotype plates for the six panel strip called Squire Edgegate by Louis Richard. The longest plates are for seven panel comic strips. 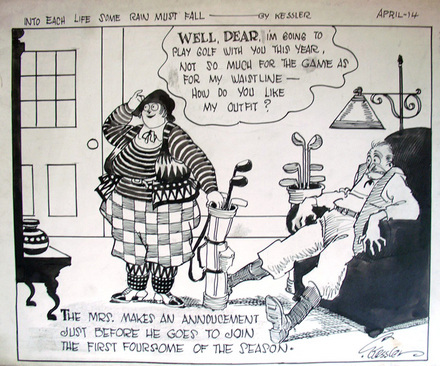 There are 100 for Bull Run by Carl Ed, who historians known as the creator of Harold Teen, and 110 for Raising the Family a comic strip from the 1920s and 1930s by an artist only known as Fisher. We would be grateful for more information on these artists. 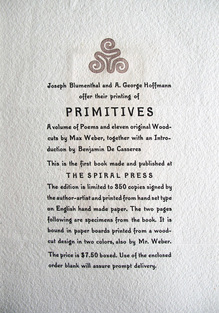 Special thanks to Mike Siravo and John Walako for helping to move these very heavy printing plates. 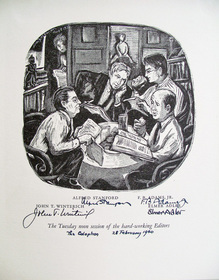 The editorial team for the Colophon: A Book Collectors’ Quarterly, which ran from February 1930-February 1940, met each Tuesday in the offices of Pynson Printers in the New York Times Annex on 43rd Street. 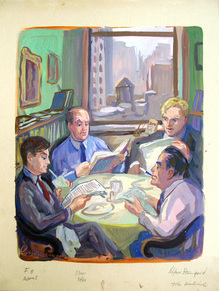 When Adler accepted a job at Princeton University and began closing his press in 1939, the artist Don Freeman (1908-1978) came by to document their meetings with a portrait painting. 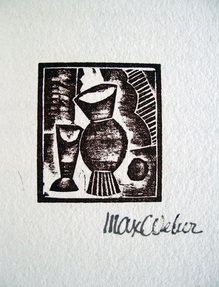 A linocut, dated August 8, 1939, was published in the Colophon in 1940 and later, in the festschrift Elmer Adler in the World of Books (1964). 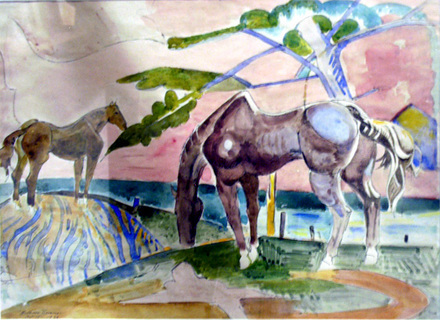 Freeman’s painting, done in gouache, is held in Graphic Arts. 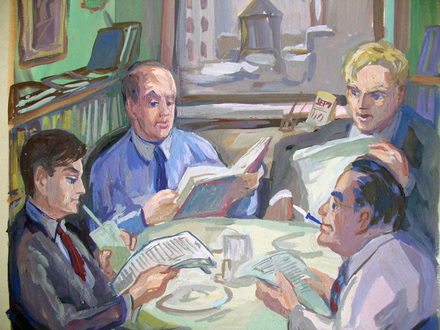 Included in the painting (from the left) are Fred B. Adams Jr., Elmer Adler, Alfred Stanford, and John T. Winterich. The calendar in the painting is dated September 10. At the back of the print, looking around the corner, is Adler’s secretary/assistant Miss Greenberg. This is the week of Apple’s 23rd annual Worldwide Developers Conference (WWDC) in San Francisco. 5,000 people from 60 countries paid $1,600 each to attend and tickets sold out in less than two hours. The winners of the Apple Design Awards (ADA) have been announced. I would post a picture of the ceremony but photographs and bloggers are banned from WWDC sessions. In the first two weeks after the release of this app, 1,500,000 people downloaded Paper and the company claims 7,000,000 sheets of Paper have already been used. 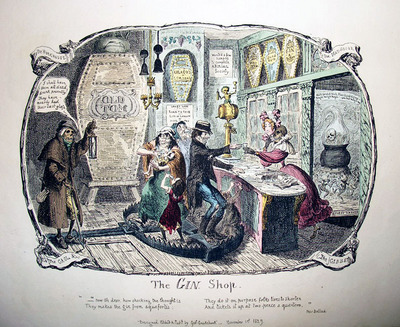 Long before George Cruikshank signed a temperance pledge, he was satirizing the gin palaces of St. James Place. This is his earliest. Images of death and dying are everywhere. Customers are standing inside a giant bear trap, waited on by a skeleton in the costume of a pretty woman (we can see her skull and the bones of her ankle and foot). 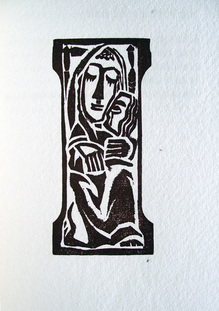 A woman is feeding gin to her baby, with the figure of death close behind her holding an hourglass. Spirits are held in coffins rather than casks: Old Tom is good gin; Blue Ruin is bad gin; Kill Devil is strong rum; and so on. 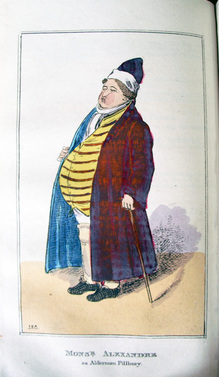 Vattemare, the Father of Interlibrary Loan. 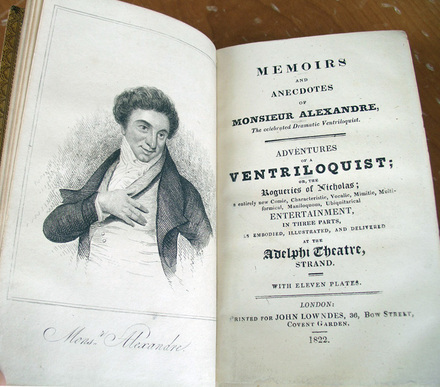 Graphic Art holds a rare copy of the memoir of Nicolas-Marie-Alexandre Vattemare (1796-1864), an actor, ventriloquist, quick-change artist, and philanthropist, who used as his stage name Monsieur Alexandre. Although trained as a doctor, Vattemare's natural talents as an entertainer led him onto the stage, a career which lasted from 1815 to 1835. Vattemare performed a one-man show in which he transformed into dozens of different characters, each with their own costumes and voices. 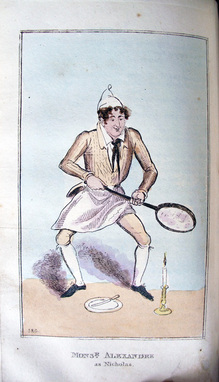 Bound with his memoir are scripts of the various sketches he performed, each one illustrated with a frontispiece portrait of that individual persona, made by Robert Cruikshank (1789-1856). Vattemare's fame led to great wealth, which he used to acquire a vast collection of rare books and coins (among other things). Late in his life, Vattemare was instrumental not only in founding of the Boston Public Library but also a system of interlibrary loans and cultural exchanges between libraries around the world. 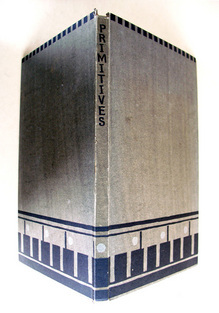 "The extraordinary life of Nicolas-Marie-Alexandre Vattemare (1796-1864)," wrote Suzanne Nash (Princeton University Professor of French and Italian, Emeritus), "known today by a handful of bibliographers as the founder of the American Collection at the Bibliothèque Administrative de la Ville de Paris and for his role in the creation of the Boston Public Library, deserves to be told, not only as a revealing page in the history of Franco-American relations, but as a window onto the rapidly changing cultural history of nineteenth-century France." That from under one hood you last night showed us twenty? Are you handsome, or ugly? In age, or in youth? Man, woman, or child? Or a dog or a mouse? Or are you at once each live thing in the house? Each live thing, did I ask, each dead implement too? A workshop in your person -- saw, chisel and screw. 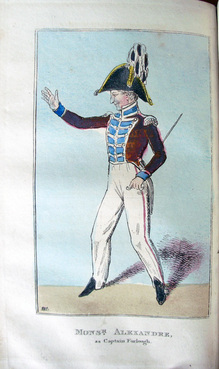 You must be, at the least, Alexandre and Co.
Must read you the riot act and bid you disperse. See also Earle Havens, "The Ventriloquist Who Changed the World," American Libraries 38, no.7 (2007): 54-57. 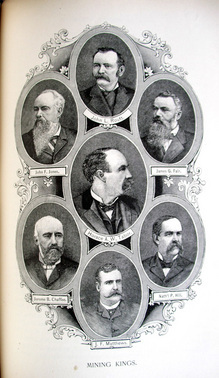 James Whitney, "Incidence in the History of the Boston Public Library," Papers and proceedings of the ... General Meeting of the American Library Association, 24 (1902): 16. 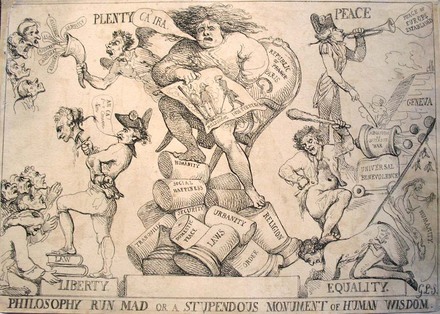 Thomas Rowlandson (1757-1827), Philosophy Run Mad or a Stupendous Monument of Human Wisdom, 1792. Etching on tinted sheet. 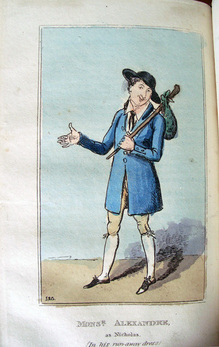 Graphic Arts GA Rowlandson Collection. 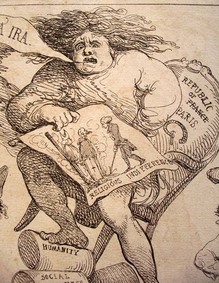 In December of 1792, Thomas Rowlandson drew a frenetic caricature focused on the French Revolution and the declaration by the new government that “no institutions alien to the principles of Liberty, Equality, and Fraternity were to be recognized.” That France should take these words, Liberté, égalité, fraternité (Liberty, equality, fraternity or brotherhood) struck Rowlandson as ironic after the bloody battles fought just weeks before this. 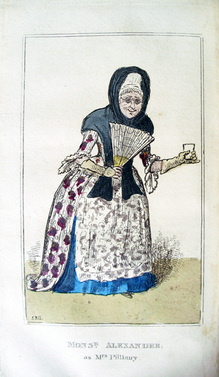 At the center of his print, instead of a beautiful young woman representing the Republic, Rowlandson places a shrieking hag, still in her nightgown. Her rocky seat of power is balanced on the ruined pillars of Humanity, Social Happiness, Tranquiliy [sic], Security, Domestic Peace, Laws, Urbanity, Order, and Religion. 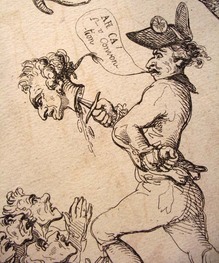 On her left is Liberty, presented as a Jacobean, with his foot firmly planted on the law and a bloody head speared with his dagger. This is contrasted on the right with the aristocratic Equality, on his knees begging for his life. 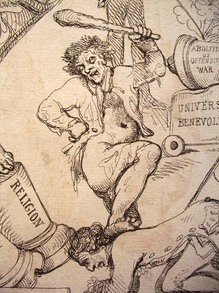 At the far right side, the word Humanity is placed by a mutilated man, whose bleeding heart is being raised by his killer. 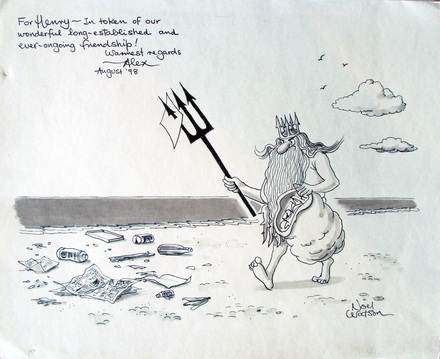 Thanks to the generous donation of Henry Martin, Class of 1948, Graphic Arts holds a small group of original cartoons by the British artist Alex Noel Watson. 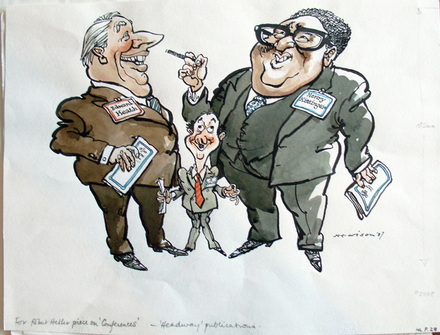 Born in Airdrie, Lanarkshire in 1929, Watson worked for the Croydon Advertiser from 1965 to 1978 as a newspaper cartoonist, film reviewer, and feature writer. 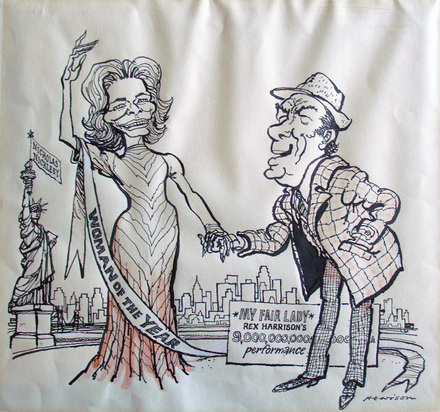 He went on to publish in many other prominent newspapers and magazines, including The Evening Standard, Spectator, Daily Telegraph, Punch, The New Yorker, The New York Times, and many others. 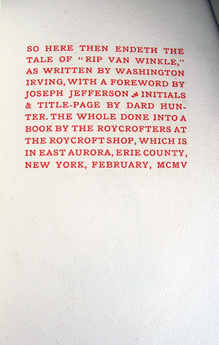 From 1904 to 1910 Dard Hunter was a Roycrofter, working for Elbert Hubbard (186-1915) at the Roycroft Shop, an art and crafts collective in East Aurora, New York. 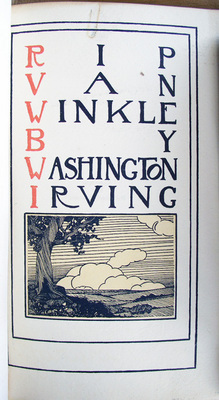 Rip Van Winkle and Nature are among his first published book designs for the group, where he also designed stain glass and other handcrafts. 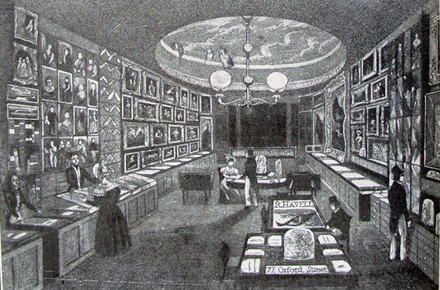 Robert Havell’s shop, The Zoological Gallery, at 77 Oxford Street, London. 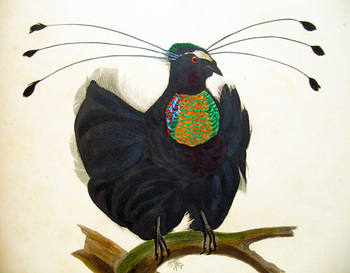 Image reproduced in Francis Hobart Herrick, Audubon the Naturalist (1917). 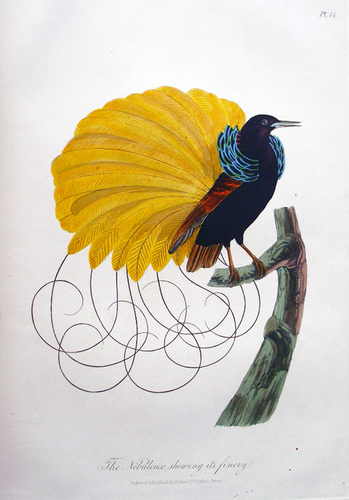 The Graphic Arts Collection recently acquired one of the rarest and most beautiful of Havell’s solo publications, A Collection of the Birds of Paradise (ca. 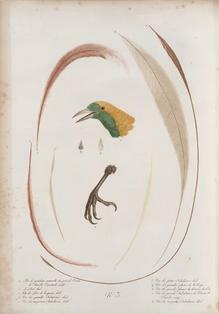 1835). While the volume was based on Le Vaillant’s earlier study, Havell redesigned several key artistic elements, beginning with the title page. 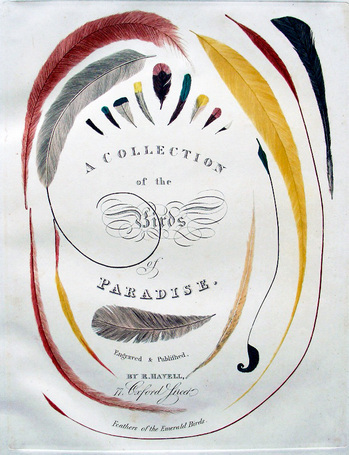 In an act of inspired creativity, he selected elements from two individual pages that examined the plumage of the males and reconfigured the elongated and elaborate feathers into a compelling title cartouche. 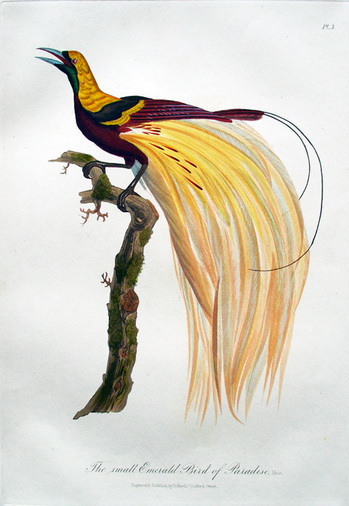 Birds of Paradise was produced during the mid-1830s at Havell’s spacious Oxford Street shop, the Zoological Gallery, where he sold ornithological prints and drawings as well as the birds themselves, stuffed and posed, along with skins or feathers. 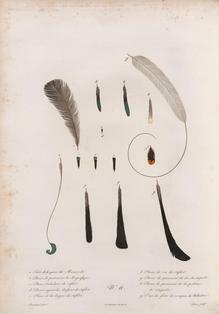 Havell hunted these birds and other small animals outside London and then, prepared them for sale using his own techniques (Yale University Library holds a notebook where Havell recorded varieties of household recipes and taxidermist instructions). 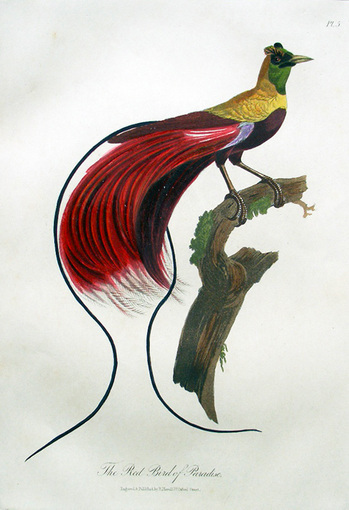 Havell and Audubon were both members of the Zoological Society (instituted 1825) and well acquainted with all the illustrated natural histories, yet it may have been at Audubon’s suggestion that Havell took on the engraving of Le Vaillant’s study. 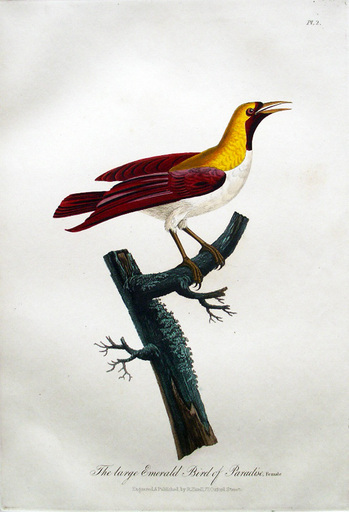 As a young man, Audubon studied briefly in Paris when the original volumes were being released and he owned many of Le Vaillant’s luxurious color plate books in his own library (Audubon’s copy of Histoire naturelle des oiseaux d’Afrique (1799-1808) is now in Cornell University’s library). Most recently this book belonged to Major General Sir Rohan Delacombe, KCMC, KBE, CB, DSO, KSt (25 October 1906 - 10 November 1991) who was a British military officer. He was the last British Governor of Victoria, Australia. Sir Rohan was appointed as Governor of Victoria in 1963 and his term ended in 1974. 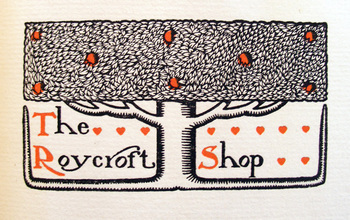 Upon his death in 1991, this particular item was part of his library in Australia and was left to his daughter.